A large luxury house with communal pool. It is situated in gardens with plants and palm trees. Spanish style house on 3 levels. The complex is totally enclosed with security access. 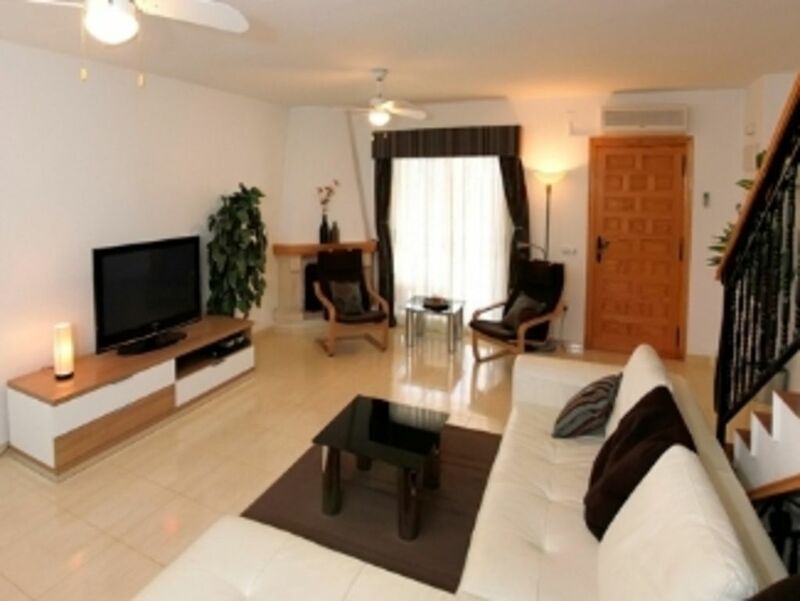 Features 2 double and 1 twin bedroom on the top floor, with balcony and en-suite from master. There are additional twin beds on the lower level, sleeps extra 2. There are 3 bathrooms in the house all with toilets, shower, bath. Kitchen is fully fitted including dishwasher, fridge/freezer, iron, ironing board, microwave, oven and hob plus washing machine and tumble dryer. Dining area includes table and chairs for 6. Lounge has seating for 6 and has UK TV on 42” plasma. Basement seats 6, UK TV on 42” plasma TV, nintendo Wii + games, computer with Wi-Fi internet access plus pool table. Garden furniture and sun beds on the terrace and balconies, plus outdoor dining table overlooking BBQ area. Underground parking available plus spaces outside the complex. There are communal tennis courts and a football pitch. Contract cleaner costs of €100 are to be paid in cash on departure. Excellent facilities and in a fantastic location. Whether its a couples holiday, a family break or a relaxing holiday with friends this house is perfect for all requirements. All include toilet, shower, bath, sink, bidet. En-suite from master bedroom. Family bathroom for bedrooms 2 and 3. Ground floor bathroom. Available for a charge at the Santa Pola life resort directly accross the road. Features leather couch, 42" plasma TV with UK channels. Kitchen is fully fitted including dishwasher, fridge/freezer, iron, ironing board, microwave, oven and hob. Dining area in kitchen includes table and chairs for 6 people. Tennis rackets and balls available, with tennis court on the complex. There are nine 18 hole golf courses within 10 to 45 minutes drive from the house. ONLY allowed outside on the veranda, absolutely NO smoking inside the property. Notes on accommodation: Air conditioning units are located in all main rooms and can be set for hot or cold air. Cot and highchair are in the house and can be setup for your arrival at no extra cost upon request. The new Santa Pola Life Resort is only 50 metres away from the house! Available to the public all year round it features an excellent Supermarket, Butchers, Newsagent and two Restaurants. Perfect for the winter months you can also make use of the resorts Indoor Swimming pool, Spa, Fitness Centre, Steam Room, Sauna and Massage & Beauty Treatments. In addition the brand new Gran Alacant Pharmacy opened on the complex in October 2010. Outside: There is a large patio at the front of the house featuring a gas barbecue. Sun loungers and outdoor seating are provided. Utility Room: Washing machine, tumble dryer, baskets and large boiler (upgraded to large size for maximum hot water). Cleaning / Towels / Linen / Maid service: Towels and linen for the house are provided. €100 cash to be left on departure for contract cleaners. Other: The basement is a great entertainment room, featuring seating for 6 people on luxury leather couches, 42” Plasma TV (UK Channels) with surround sound system with recent films on USB drive + Wii. Computer with Wi-Fi Internet access plus a pool table. Listing description very accurate, property very clean and well-maintained. Despite arriving later than expected, due delay in hiring car, we were met and shown around property by the representatives. Would certainly recommend this property to friends & relatives. Property is in a quite location, whilst the resort is also fairly quiet, with a good selection of bars & restaurants within walking and driving distance. Parking on the road outside, can be a 'hit or miss', but we always found somewhere to park, within a reasonable walking distance. Our only 'complaint' would be that no 'non-slip' mats were provided for the showers/baths. This might be a problem for younger or older visitors. The sandy beach is approximately 10 minutes walk from the house it is possible to walk along to the next resort of Los Arenales or along the coast the opposite way to Santa Pola. The beach is serviced with bars and sun lounger rental. Alicante airport is accessible by taxi. For wider access to tourist areas such as Benidorm car hire is recommended. However there are local bars and restaurants within 300/400 yards from the house. The Santa Pola Life Resort opened in 2009 and is an excellent leisure time option right across the road from the house. Open to the public all year round, it features an excellent supermarket, plus newsagent, 2 restaurants as well as an Indoor Swimming pool, Spa, Fitness Centre, Steam Room, Sauna and Massage & Beauty Treatments. Booking Notes: For availability and booking please contact via email or phone. €300 (£250) deposit taken to reserve booking, with the balance paid 8 weeks before the entry date. This will then act as your refundable security deposit which is required and will be paid back (providing no damage) 14 days after your holiday. A contract cleaner will visit the property on your departure and a cash sum of €100 should be left (Euro only) in the house for this purpose. Changeover Day: Checkout time is 10:00 Check-in time 16:00. These can be flexible. Changeover day is also flexible.